Softelnet is a manufacturer, distributor and supplier of advanced IT solutions and services for companies aiming at improving their business processes. The company has been operating since 2001. From the very beginning, it has been focused on creating dedicated IT systems which may be applied mainly in telecommunications, retail, industry, insurance and utilities branches. 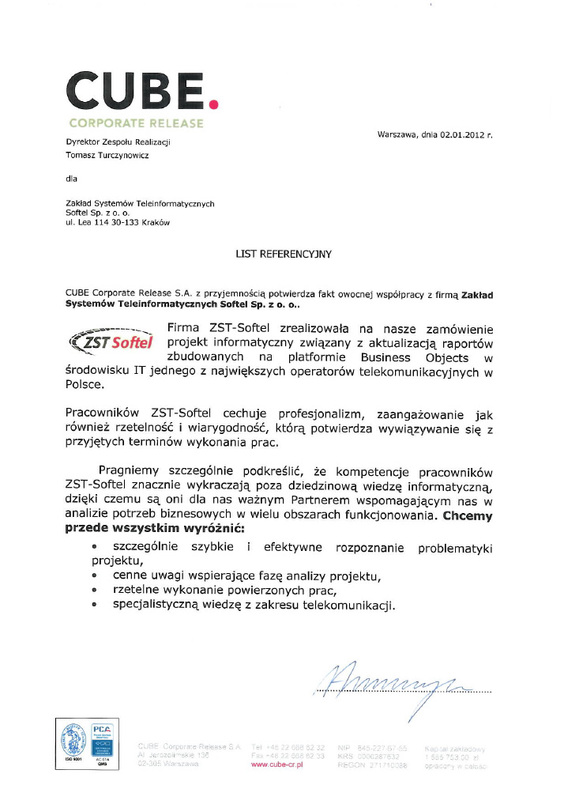 Softelnet takes part in realizing strategic projects for one of the largest telecommunications companies in Poland. Its market status is built due to the efforts of a team of leading specialists consisting primarily of IT and telecommunications graduates. A growing number of successfully-implemented projects and our clients’ trust result in continuous, dynamic development. Softelnet’s development strategy assumes long-term cooperation with key clients and diversification of the offer by placing new products on the market. Due to the experience gained during over 15 years of operating on the IT market, Softelnet is perceived as a reliable and trustworthy business partner. CUBE. Corporate Release SA – specializes in creating and supplying innovative technological solutions for medium-sized and large IT and telecommunications companies. One of the services provided by Softelnet within the framework of the cooperation is outsourcing of IT specialists for the purpose of big projects for corporate clients. 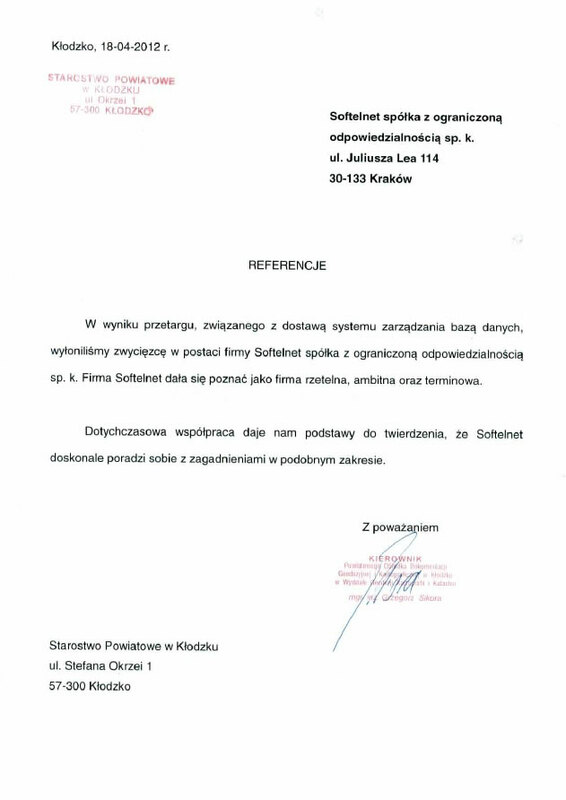 Polska Telefonia Komórkowa Centertel Sp. z o.o. 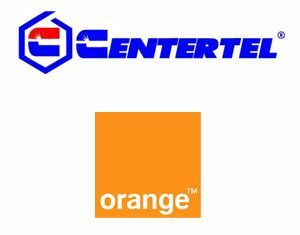 – a mobile network operator offering mobile and landline phones, mobile and landline Internet access, data transfer and multimedia services under Orange brand. PTK Centertel is owned by Telekomunikacja Polska S.A. One of the projects realized during the long cooperation is implementing the Sales Information System, supporting the quality standards control within PTK Centertel sales and services network and covering all components of the organizational structure (company outlets, agent stores, franchise stores). Sygnity S.A. – one of the largest IT solutions suppliers in Poland. The Sygnity group was formed by joining ComputerLand and Emax companies. One of the services provided by Softelnet within the framework of the cooperation is outsourcing of IT specialists for the purpose of big projects for corporate clients. Interpro Sp. z o.o. – deals with creating advanced based systems, mainly by means of J2EE and related technologies. Opal Maksimum – one of the largest Silesian commercial properties companies located in southern Poland. The services provided by Softelnet include manufacturing and maintaining a dedicated software based on the MatroX-Sales GSM system. 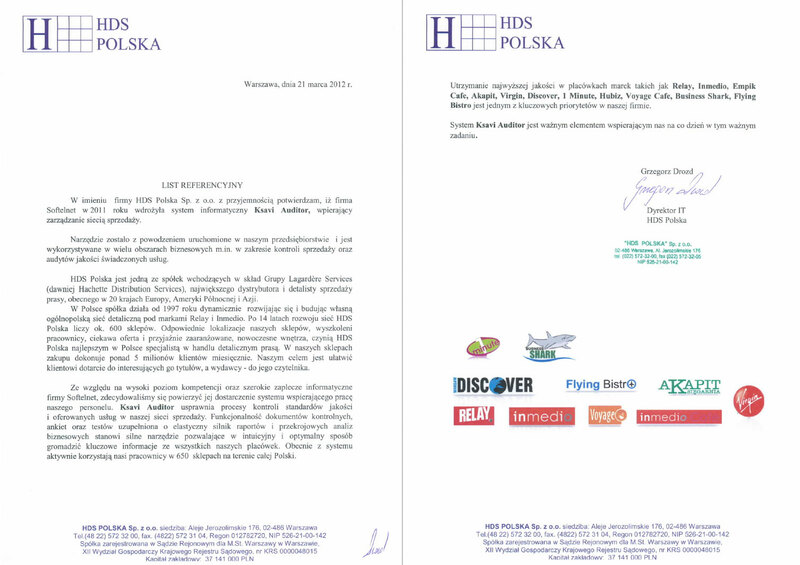 HDS Polska – one of the companies forming the Lagardere Services (previously Hachette Distribution Services) group, the largest press distributor and retailer operating in 20 countries in Europe, North America and Asia. 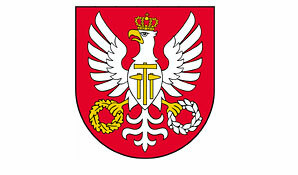 The company has been operating in Poland since 1997 and developing dynamically. Its nation-wide retail chain includes brands such as Inmedio and Relay. After 14 years of development, the HDS Polska network consists of around 600 stores. Wieliczka District Starosty – focuses on automation and digitalization of the office so that the citizens and tourists do not have to deal with lines in the office, and the personnel may gain new qualifications. 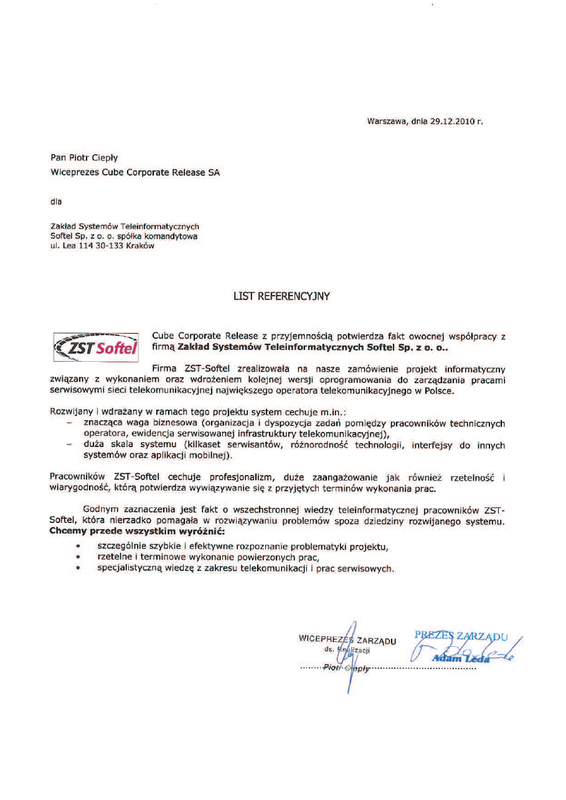 Softelnet provided the Starosty with Oracle database software. Limanowa District Starosty – uses comprehensive IT solutions in terms of information security management and raising the personnel’s qualifications. 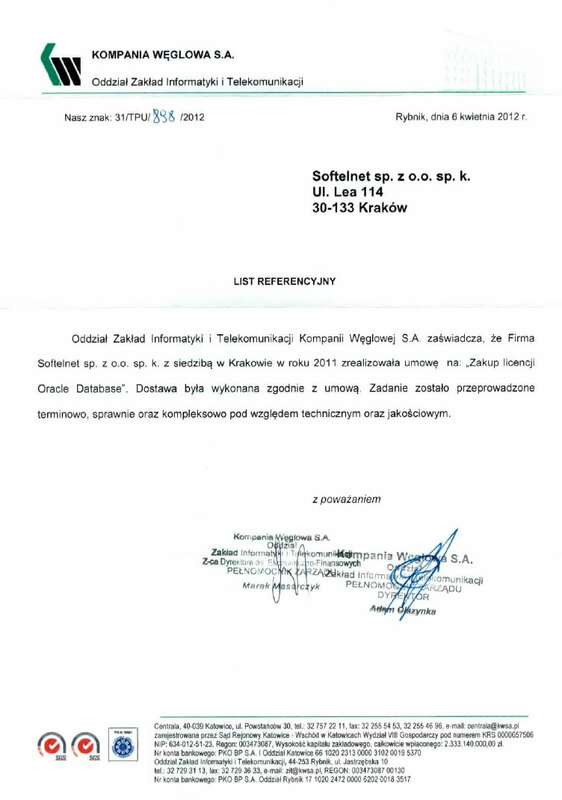 Softelnet provided the Starosty with Oracle database software. GE Dystrybucja S.A. Zamość Division – the company’s primary business activity is distribution of electricity in accordance with a granted license. PGE Dystrybucja S.A. Zamość Division supplies electricity to 428 thousand recipients. Kompania Węglowa S.A. – by taking part in the bituminous coal mining restructuring process, the company creates its innovative market, production and financial image of a functionally organized, effectively managed company, trustworthy for its business partners. 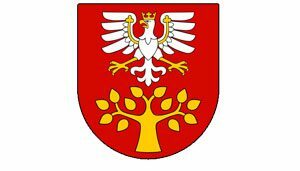 Kłodzko District Starosty – uses ePUAP system (electronic Platform of Public Administration Services) due to which citizens may use its services online, and the representatives of public entities may share their services in an electronic form free of charge. 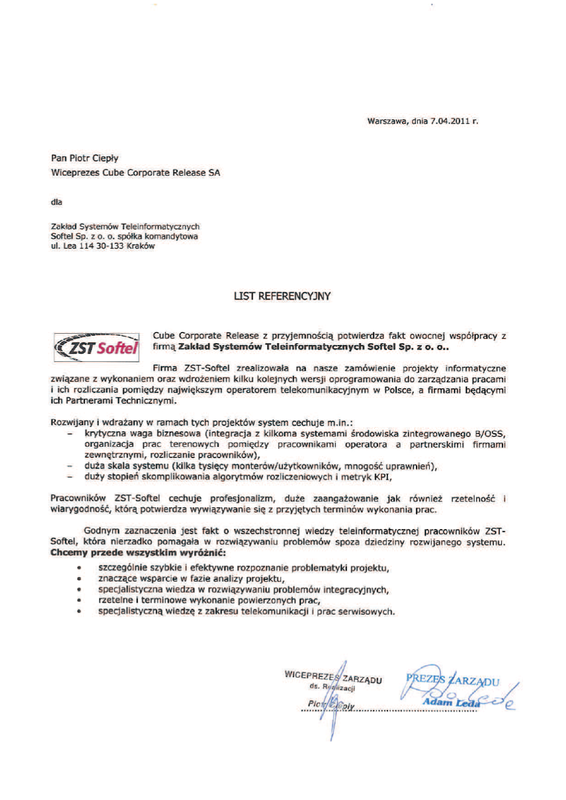 Softelnet provided the Starosty with Oracle database software. Oracle – one of the largest software manufacturers in the world. It creates IT solutions for the purpose of broadly defined company management, and in particular database management systems. As a business partner Softelnet is a distributor of Oracle Business Intelligence solution and Oracle databases. Requinno – specializes in creating professional software and provides IT business services, particularly in terms of OSS, ERP, TT, WFM and FSM systems. Requinno is also a manufacturer of the WorkSIDE system distributed by Softelnet..
Demetes – specializes in creating and supplying innovative solutions improving business processes conducted by clients from numerous branches. One of this solutions is Sales Network Control Support System eCatio distributed by Softelnet. He graduated from AGH University of Science and Technology where he was studying information technology on the Electrotechnology, Automated Technology and Electronics Department. He is a co-founder of the company and has several years of experience in the IT branch. At Softelnet, he deals, among others, with financial, legal and administrative aspects, creating a development and strategy vision and the area of selling solutions and services to corporate clients. He graduated from AGH University of Science and Technology where he was studying information technology on the Electrotechnology, Automated Technology and Electronics Department. He is a co-founder of the company and has several years of experience in the IT branch. At Softelnet, he deals, among others, with recruitment processes, personal management, financial investments and sales support. He graduated from AGH University of Science and Technology where he was studying telecommunications on the Electrotechnology, Automated Technology and Electronics Department. He has several years of experience in the IT branch. At Softelnet, he deals, among others, with the area of selling solutions and services to corporate clients, extending the scope of the company’s business activity and cooperating with investors and business partners. He graduated from AGH University of Science and Technology where he was studying information technology on the Electrotechnology, Automated Technology and Electronics Department. He is a co-founder of the company and has several years of experience in the IT branch. At Softelnet, he deals, among others, with placing new products of the company on the market, applying innovative IT technologies and optimizing production and sales processes. He graduated from AGH University of Science and Technology where he was studying information technology on the Electrotechnology, Automated Technology and Electronics Department. He has been working for Softelnet since 2004. He has been a Vice President of the Board since 2011. At Softelnet, he deals with creating and realizing IT projects for telecommunications sector, sales support and supervising quality procedures. Our mission is to understand the needs and operating environment of the customer. We constantly improve our competencies. We combine this with over 20 years of experience, expertise and strategic thinking. We deliver modern systems and innovate services. This is how we support the grow of our customers' business.